Some say the key to prediction is more / better information. At the same time, can’t too much information be overwhelming? Statistician, Nate Silver calls this overload of information, the “noise.” He makes the point that in today’s world of big data, the difficult task is to separate out the “signal” from the “noise.” Basically: What information matters? And what information doesn’t? This overload of information is the case with predicting heart attacks. Writer Malcolm Gladwell tells the story of Cook County Hospital in his bestselling book: Blink: The Power of Thinking Without Thinking. So what do predicting oil prices and predicting heart attacks have in common? Exactly what I have already implied: Maybe more information is not always better. Is there a simpler way – a way that does not give most of us a headache? Is there something that anyone can easily follow that would give us insight into all of the available information on oil? A variable that allows us to tune out the noise, and focus on what matters? There is: It’s the price! Every variable, both known and unknown that are influencing and constantly setting the current, and future, price of oil are captured in the price. If oil prices are moving higher – we predict higher prices. 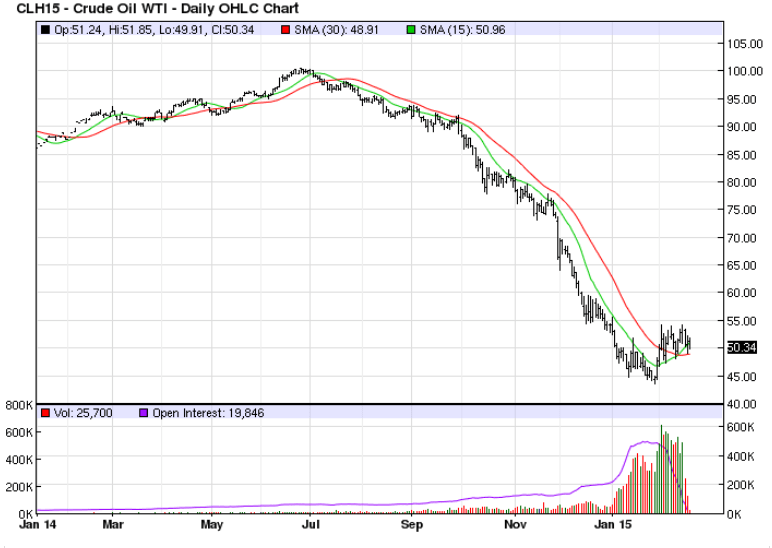 If oil prices are moving lower – we predict lower prices. Trend-following trading, however, is not really a prediction at all. Like the name says: It’s following. Just to show the idea, let’s make a few imaginary predictions (post-hoc) using only the price of oil as our indicator. If the green line (the 15 day moving average of prices) is above the red line (the 30 day moving average of prices), we predict that prices will go higher. If the green line is below the red line, we predict that prices will go lower. Over the last year, if you followed a trend-following rule, like the one above, you probably would not be wrong very often – and when you were wrong, you would not be wrong by much. Fivethirtyeight.com economic writer Ben Casselman asserts that it is basically impossible to predict what the price of oil will do. He is right. Commodity prices are impossible to predict in a systematic way. Commodity prices are, however, easy to follow in a systematic way. Good-grief, following the signal in the graph (above) would have begun pointing to lower oil prices beginning in July-August of 2014. Feel free to play with different time frames and a few other commodities to see it for yourself. But can trend following actually work, you ask? *This is for informational purposes only, and not a recommendation to buy or sell. There is substantial risk of loss to futures and options trading. One should carefully consider their financial suitability prior to trading futures or options. A longer version of this article was originally published under the title: How to Predict the Price of Cotton (And Everything Else).